Commenters said I was being unfair (and perhaps I was) as the XT network is much better than AT&T’s, there is fiber to each cell site and we have data limits in New Zealand that will prevent overload. 3: This morning all hell broke lose and the network died South of Taupo. 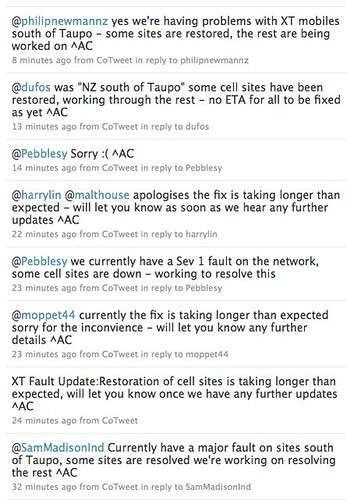 Credit to @TelecomNZ for responding on Twitter. I’m pretty sure that despite the quantity of T-Sticks sold that there is another reason for this, but regardless, the timing is lousy for Telecom and the incident is terrible for all of us. What’s the use of a free T-Stick (or a phone for that matter) on a network that does not work? As we become more and more dependent on mobile devices, both for voice and data, it’s incredible that a company like Telecom can fail in this way. Their response will be telling. Customers’ ability to contact emergency services during the outage had not been affected, Ms Murphy said. is simply wrong. I am one of the incraesing number of people with no home phone, and while I do have Skype as a backup I can say that my ability to call 111 from home is affected. Meanwhile we cannot just ignore any 111 call requirements for those that are not at home. 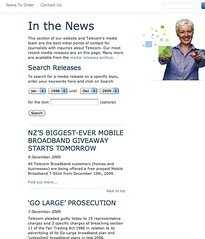 If you look at http://www.telecom.co.nz/status it shows the status of their services. It definitly has the outage listed. Yes, its disappointing when a new service falls over. However its new, its bound to have teething issues just like anything else. The XT network is certainly worthwhile in my opinion being on, even with these outages. Also RE can’t make emergency calls – My understanding is that the phones would allow 111 calls but would not connect to any others so contact to 111 was not disrupted. If your relying on one way to contact 111 and that way goes down then thats your choice. What if someone took a 4WD and rammed it into the Telecom tower? If you have a high-resolution screen and go to the “Help” page, you can see some road cones in the bottom right corner. Is it just me, or are they trying to hide their network status message? http://www.telecom.co.nz/help which pretty clearly shows service status with a big red X by mobile. If they are trying to hide it, they are failing badly. I expect that Telecom will claim the fault to be that of their supplier with whom they worked to ensure the problem does not recur. They will attempt, therefore, to deflect some of the “crap” from themselves onto their supplier. Now perhaps some of that “crap” should fall on their supplier but Telecom chose that supplier and negotiated service level agreements with that supplier. It isn’t the supplier’s service but Telecom’s service and it should catch all the flak from the outage. This may seems a bit much to you but I have heard this approach taken a number of times now. The problem isn’ the fault of company X’s but that of their supplier (i.e. company Y); however, company X has worked with company Y to make sure it doesn’t happen again. I dont think they will blame anyone because the cause of the issue isn’t likely to be publically revealed. It doesn’t matter anyway, it doesn’t work. Why does it matter why? The Telecom Status page @ 8:27am this morning was all green – (green for mobile/broadband/landline) this was over 90 minutes after the failure. I thought a Status page would give real time status … clearly not. Don’t mind the occasional outage … but seriously so butts need to be kicked. This is supposed to be the most advanced network in the world (well newest at least). Why with a critical piece of infrastructure is there no DR? My guess … the accountants have been in there f-ing around with sh%t they don’t understand, like making the “fix up network team” redundant as a cost cutting measure. Ironically TEL is moving up on the NZX … shareholders like the outage? 111/112 emergency numbers can be called from any phone in NZ with a SIM in it providing it is within a XT, VF or 2degrees coverage area. When XT was dead assuming your phone wasn’t locked to UMTS only it would have displayed emergency calls only when it was connected to the VF or 2d networks and would have allowed you to dial 112 on all handsets or 111 on most handsets. 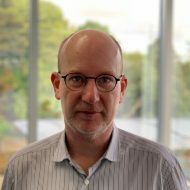 One industry insider says the problem is Telecom has two RNC’s (one Taupo north, the other for everything south) and no redundancy, whereas Vodafone has five RNCs. 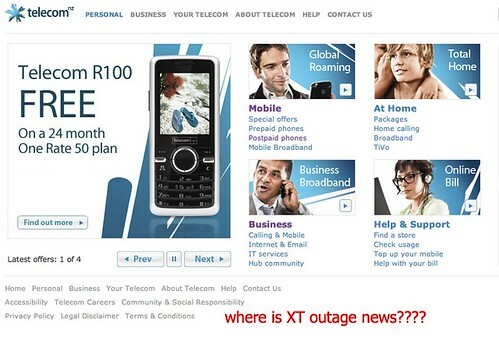 I see they now have a link on their homepage that says # XT Network outage new! . However if you click on the link, it goes to a broadband problem. No mention of the outage from them or apology. This is supposed to be a professional company. Even small web hosts have better network status pages than this, and keep their customers more informed. Not many of telecoms cusomters probably know what twitter even is, let alone were able to access it via their mobile broadband connection. Its now resolved, probably why it was going to the wrong place. They had it on their IVRs, first thing that played. Its also on the first page of their Help section. I dont think any other providers put their network status on their homepage. Orcon does. And there is genuine reason when a network this important goes down for that much area and time. I vowed never to use Telecom 7 years ago, prior to that I had everything with them Land Line Mobile interenet. I have a VoIP wireless phone, just to ensure none of my money goes to them indirectly via another service provider.